Already have a Yatra for Business account? 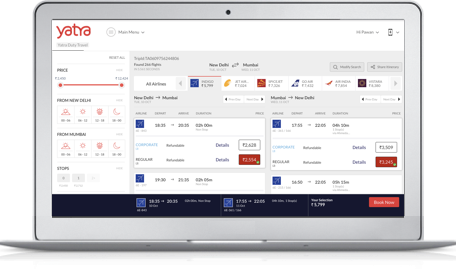 The largest platform to book & manage all your Business Travels! Rs. 500 off on first flight booking. Rs. 1000 off on first hotel booking with a minimum transaction of Rs 3000. Let numbers do the talking! And let India’s largest brand in Business travel take care of your organisations travel needs! Granular, detailed reports in downloadable format. And real-time dashboard enables you to be on top of your company’s travel spends & trends at any given time. First name should contains at least 2 characters,Only letter is allowed. Middle name should contains at least 2 characters,Only letter is allowed. Last name should contains at least 2 characters,Only letter is allowed. Please select valid GST state. State code (First 2 digits) should match with the State entered above,GST must be a 15 digit number and 14 character must be Z. Your company is already registered with Yatra for Large Business. Please get in touch with your travel desk or sign up with a new email ID.